The weather forecast was for a dry sunny evening at the end of a long hot day, so I decided it would be nice to head into the hills for sunset. 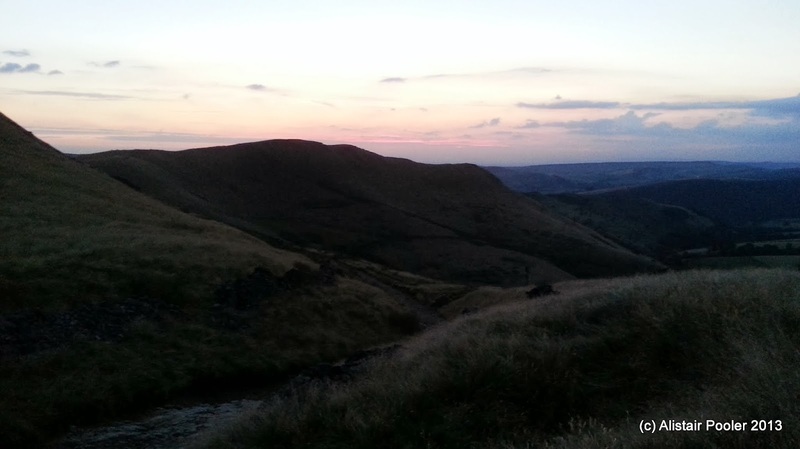 I set off walking just before 8pm from the Rushup Edge road and followed the old sunken track known as Chapel Gate NE into open country. Soon I passed a small group of mountain bikers, before the track levelled out. 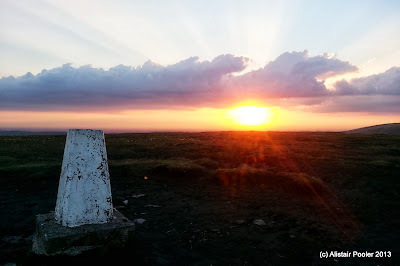 There were excellent views from up here, including towards the Kinder plateau and the nearby ventilation shaft for the Cowburn Tunnel, which takes the Manchester-Sheffield railway line underneath the moorland I was about to cross. At the highest point of Chapel Gate I left the track to follow a normally boggy path north-westwards across the moorlands; however due to the recent warm dry weather most of the ground was pretty dry this evening. At around 8:45pm I reached the trigpoint on the summit of Brown Knoll (Dewey) just before the sun began to set. I stopped here for 10-15 minutes for a break whilst watching the sunset and taking lots of photos, both on my camera and my new phone! Looking at the map, I was not yet even half-way round my planned circuit so I decided not to linger any longer and continued over the moorland to reach a slabbed path on the far side of the wall, which I don't recall being slabbed last time I was here (although that was some years ago now!) Anyway I turned left along the path and made good progress towards South Head. The slabbing lasted for around a kilometre, which was followed by a pleasant grassy path for the rest of the way to the Pennine Bridleway at South Head. In fading light I turned left onto the obvious track, known as The Roych, which carries the Pennine Bridleway back to the Rushup Edge road. There were good views towards the twinkling lights of Chapel-en-le-Frith and the hills beyond. Soon I passed a second group of mountain bikers, kitted out with bright lights, in the gathering gloom. In fact the only other people I saw out on this walk were mountain bikers! By now it was time to start using my head torch for the descent down into Roych Clough.